A MAJOR DISTRIBUTION HUB IN THE PORT OF PHILADELPHIA’S BACKYARD: The number of distribution and fulfillment centers located in the Lehigh Valley and central Pennsylvania, southern New Jersey, and Delaware have multiplied. The arrival in Philadelphia of the M/V YM Essence is the first call under THE Alliance. Shippers now have additional options for cargoes originating to and from North Europe. A $300 million Port Development Plan will double the container volumes moving through Philadelphia. THE Alliance made its first call to the Port of Philadelphia’s Packer Avenue Marine Terminal (PAMT) last week as part of its Northern European, AL1 (Atlantic Loop) service. THE Alliance, short for Transport High-Efficiency Alliance, is one of three major shipping alliances, and is made up of Hapag-Lloyd, K-Line, Mitsui OSK, NYK, and Yang Ming. The arrival of the M/V YM Essence with a capacity 4,600 TEU, is the first call by these lines under the vessel sharing agreement known as THE Alliance. Shippers now have additional options for cargoes originating to and from North Europe. Years of growth in the number of distribution and fulfillment centers located in the Lehigh Valley and central Pennsylvania, southern New Jersey, and Delaware have resulted in a major distribution hub in the Port of Philadelphia’s backyard. 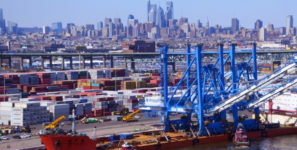 In November 2016, Pennsylvania Governor Tom Wolf announced a $300 million Port Development Plan which will more than double the container volumes moving through Philadelphia. “This new service validates what we have known for a long time. Philadelphia is a more efficient supply chain option for major beneficial cargo owners (BCOs)”, said Jerry Sweeney, PRPA’s Chairman. Ports of call for the AL1 will be: Philadelphia, New York, Halifax, Bremerhaven, Antwerp, London Gateway, and Norfolk.